Athletic Republic Conditioning Cords provide controlled resistance while allowing athletes to perform at game speed velocities, greatly improving sport-specific power for hitting, throwing, running, shooting, spiking serving and/or jumping. 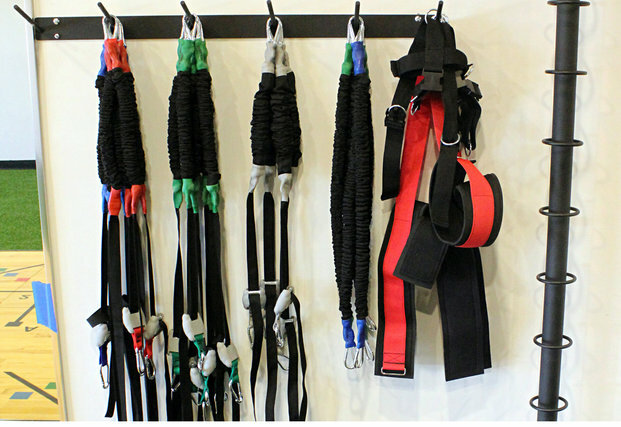 ; Our patented SprintCords, KickingCords, ThrowingCords, PowerCords, Hitting Harness and ;Warm-up Cords ;provide resistance without changing or affecting proper mechanics. ; When the conditioning cords come off, athletes produce more power than ever before. All cords come in Pro and Varsity resistance levels. Athletic Republic's Warm-Up Cord is designed to train the accelerator and decelerator muscles used in throwing and are suitable for every field position or any sport such as baseball, softball, football, water polo, volleyball and tennis, which involve a throwing motion. When teaching the training drills stress the importance of keeping the arm stretched or fully extended during the recovery phase in order to fully engage the decelerators. Anyone who uses the Warm-Up Cord knows that when you remove it, your arm feels like a 'whip.' It's very important to execute a throwing motion with a ball after the cord is off. Since the arm is moving at a higher velocity the decelerators will have to work harder in a natural throwing motion. It's vital that this contrast training approach is executed since it works the muscles eccentrically, which is how they work during the throwing motion. The 1-2-3 count works the decelerators concentrically so the progression produces the type of stimulus that is hallmark of most Athletic Republic training programs. As well as throwing, the Conditioning Cords are used on the Plyo Floor. A secured belt is fastened around the hips of the athlete and a Resistance Cord attaches he or she to the hooks on the floor. While practicing their footwork, athletes are also working on their balance and strength. As they jump, hop and step with the cords attached, they're improving their strength and control. When the cords are removed, athletes produce even more power than they had when they first began training. There's nothing holding you back from getting in shape and working hard this season. Leave all the holding back to our Resistance Cords.